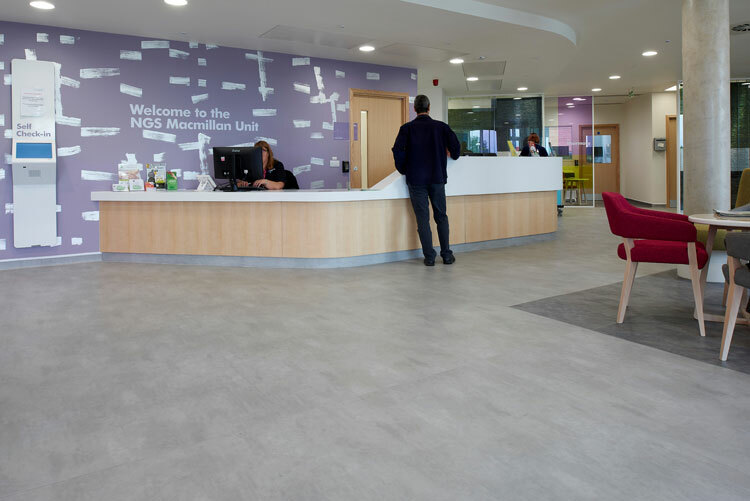 Expona Flow sheet vinyl flooring from Polyflor, the UK’s commercial vinyl flooring specialist, was recently installed at the new NGS Macmillan Unit at Chesterfield Royal Hospital, a pioneering centre for people affected by cancer across North Derbyshire. 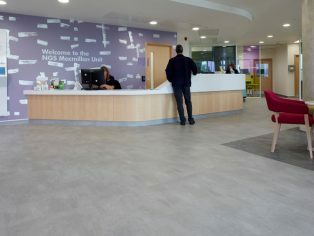 Expona Flow PUR vinyl flooring in the Light Grey Concrete and Cool Concrete shades was installed throughout The NGS Macmillan Unit by Active Flooring in the reception area, circulation areas, corridors, staircases and wards. 2000 PUR homogeneous sheet vinyl flooring in Stream was also used for the staff kitchenette area. Macmillan Cancer Support has been working in partnership with Chesterfield Royal Hospital NHS Foundation Trust to build the new cancer centre which offers vital treatment, care and support to cancer patients. £2.5 million of the £9 million it cost to create the centre was raised by cancer charity Macmillan, with a £1.5 million donation from the National Garden Scheme. The new centre enables the hospital’s specialist teams to provide all out-patient chemotherapy and clinical haematology in one place, with 21 chemotherapy treatment chairs, two treatment beds and three treatment rooms with couches available. Other services on offer at the NGS Macmillan Unit include specialist information and advice, counselling, complementary therapies and access to support groups. Expona Flow’s environmental credentials are impressive, achieving a BRE A+ rating for healthcare interiors and Indoor Air Comfort Gold, assuring that VOC emissions are below any globally determined levels. It is also 100% recyclable via the Recofloor recycling scheme and contains recycled material.